List Rules Vote up the WWE signs that scored earned a TKO. Typically funny fan signs at major sporting events make some sort of sense, but such is not the case with WWE fan signs. While fan signs of other sports usually involve clever puns about the athletes, team names or network that's broadcasting the game, wrestling fan signs are as unified as a 4chan chatroom, united only by their love of trolling. Funny WWE signs are all about making the most hilarious jokes with the least amount of logic possible; essentially, the signs provide a method of IRL trolling. Sometimes, funny signs that make no sense manage to say more than a sensible sign ever could. The more irreverent and irrelevant the better, though it's pretty safe to assume that most wrestling fans don't even know what the word "irreverent" means. These funny WWE signs managed to make it on TV not only because they body-slammed basic human logic, and also because they're pretty damn funny. 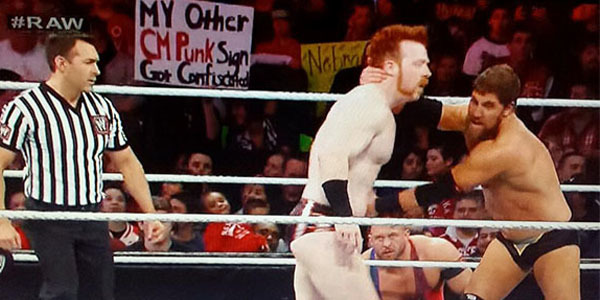 When it comes to taunting the best of the WWE, nonsensical signs definitely know how to do it.